In the Facebook status, we find 「xì+qǔ 戲+曲 」 (-豆) ("drama"). In the image below is the stylized seal form of xìqǔ 戲曲 ("drama") written as a single character, with 豆 being removed from 戲 and replaced by 曲. The post says that this is a xīn chuàng hànzì 新創漢字 ("newly created Chinese character"), and maybe it is, but I seem to remember that I've seen it someplace else before, though I can't remember where. The stylized seal form of the polysyllabic character for「xì+qǔ 戲+曲 」 (-豆) ("drama") constitutes the logo for The Xiqu Center of Taiwan, a very impressive and almost completed complex in the Shilin District of Taipei City. It is significant that the Center uses the Hànyǔ pīnyīn 漢語拼音 ("Sinitic Spelling") romanized transcription of the word xìqǔ 戲曲 ("drama") instead of the English word in its translated name. This has occasioned considerable opposition in Taiwan, both for the avoidance of English and for the use of Pinyin, which is associated with the PRC. There was a controversy over a similar usage in Hong Kong not too long ago: Xiqu Centre. 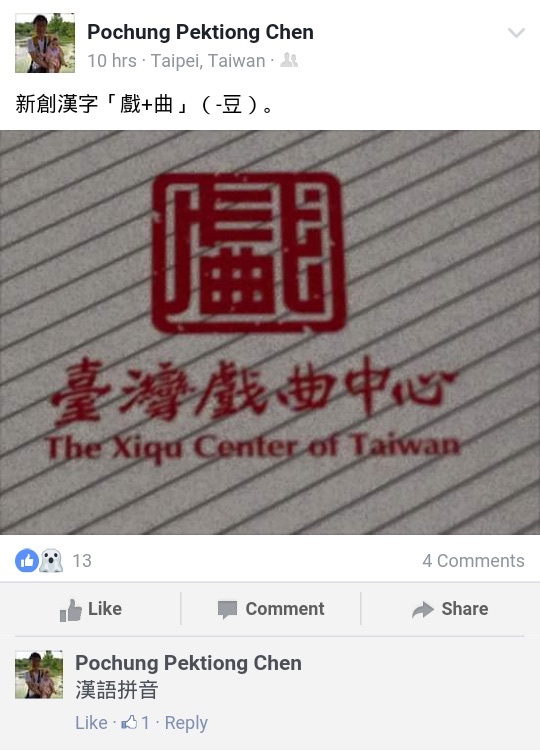 Aside from the polysyllabic character for xìqǔ 戲曲 ("drama") and the use of Pinyin "xìqǔ" instead of "drama" in the English name of the Taipei Center, one other interesting aspect of the Facebook post is the author's name, Pochung Pektiong Chen. In hanzi that would be Chén Bózhōng 陳柏中. The "Pochung" romanization is based on Wade-Giles, and the "Pektiong" romanization is based on Pe̍h-ōe-jī (POJ) for Taiwanese. There's a lot going on in this interesting Facebook post, and we haven't even gotten into the comments! Polysyllabic characters for units of measurement: here and here. His family name, however, seems to be written in Pinyin? Or maybe the apostrophe of the Wade-Giles "Ch'en" has simply been omitted. According to the Internet, though, it would be "Tân" in POJ. You're right, Simon P. Both his W-G and POJ romanizations are, shall we say, "modified" — as is very common in Taiwan. That's why I said "based on".